There are currently 94,210 users on this website. US$550 delivered to the US; international shipping available - please contact me for a quote. 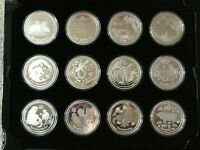 This listing is for a complete collection of the 12 different 1 oz uncirculated silver coins issued by the Perth Mint in Australia for the 2012 Lunar Year of the Dragon. The coins come in a Lunar Year box with an outer cardboard sleeve. All coins come in their original capsules. Please note that while all coins are authentic releases by the Perth Mint, I put this collection together myself.